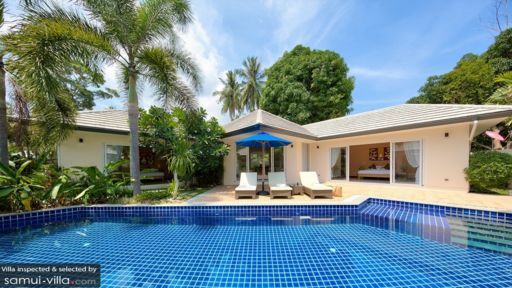 Villa Baan Rim Talay is a private and secluded paradise within the beach paradise of Lipa Noi. Amidst the villa's tranquil tropical surroundings, you can simply trifle away the day. Because here, time crawls by ever so slowly. You’ll never have to think and worry about anything. Within its walls, you will find every sort of luxury you need should you wish to just disengage from the outside world. Truly, at Baan Rim Talay, you can have it all. The villa has two (2) bedrooms that open out to the pool area. Both are furnished with king-sized beds. A distinct feature of the bedrooms is a long and wide mirror on one of the walls. Below it is a long, multipurpose counter and drawer. Both bedrooms also have a flat-screen TV connected to a Blu-ray player as well as to the internet. Each bedroom has its very own spacious bathroom with bathtub, shower as well as his and her sinks. Running across the center of the villa is a long, polygon-shaped swimming pool where you can do laps or simply allow yourself to float and wade aimlessly. Right after getting out of the water, you can catch some sun as you stretch out on the day beds on one side of the pool. Or, you can cool off under the shade of the gazebo on the other side. Provided with a table for four (4), you can dine al fresco right here or lounge for after-dinner drinks as you wind down for the day. 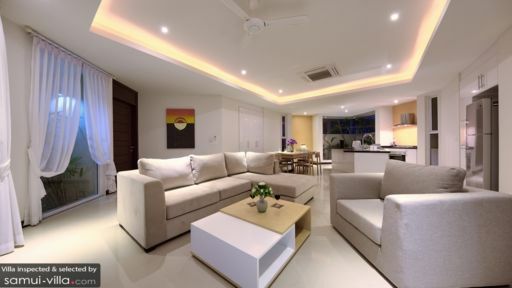 Indoors, the Living Area is furnished with a large, comfortable couch and a single easy chair. A wide, flat-screen TV connected via satellite and to the internet as well is provided. So that you can check out what’s happening in the world – once in a while. Also provided is a sound bar to satisfy the audiophile in you. Sharing the space is the dining area with a set up that can accommodate six (6). Between the dining area and the villa’s fully-equipped kitchen is a long prep counter where you can show off your culinary skills. Villa Baan Rim Talay has its very own Guest Management Concierge. Headed by a multilingual Guest Manager, the team makes sure that anything you need is provided and that your every request is met. Housekeeping at the villa is done twice a week. And security personnel are on duty round the clock. 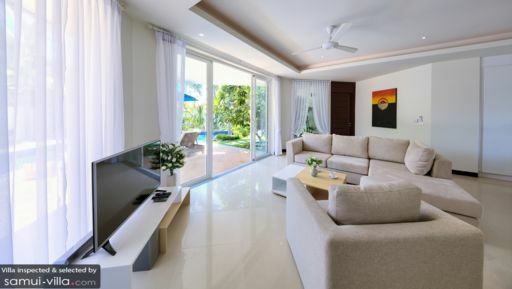 Baan Rim Talay is part of the Lipa Talay cluster of villas located on the white-sand beach of Lipa Noi. From the villa, it only takes a minute to walk to the beach. So you can say that the water is just out your front door. You can also sail to the very popular Five Islands – directly in front of the Lipa Talay villas just off the coast. Once you’re back on the beach, wander off. About a kilometer away, you’ll findrestaurants, cafes and bars which you can reach by car or bike. If you wish to experience truly intensive spa treatments, make sure to visit the Samui Dhama Healing Centre.